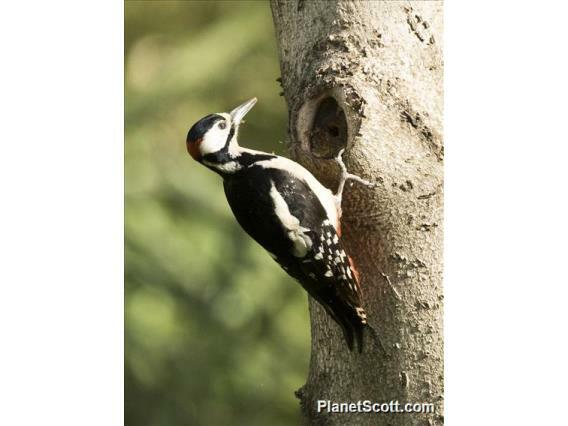 Instead of singing, great spotted woodpeckers drum against dead trees, telephone poles and even metal chimney pipes. They can't sing well at all. They are commonly found in woods, gardens and parks where they search for lots of insects and tree seeds. Sometimes, you find a woodpecker forge in a pine trunk: this is a collection of pine or spruce cones. The woodpecker clinches cones filled with seeds firmly in the wood. It plucks out all of the seeds and replaces the cone with a fresh one. All of the empty cones lie under the forge on the ground.